The development of photonics science and the resulting expansion of photonics industries throughout the 21st century will usher in an era of photonics, when light will play an even greater role for mankind. Light has unlimited potential, and us humans have explored only a small part of it. The human race will continue its endless challenge for identifying the essence of light and manipulating it freely. This challenge is the driving force for evolving both photonics science and photonics industries. In 1926, television was born in the city of Hamamatsu. It was a great achievement that set off the prosperity of the electronics industry in the 20th century and heralded the rise of the photonics industry in the 21st century. The technology evolved into the photonics industry in Hamamatsu, where the research of photonics science was continued, fulfilling a major role in social development. If light has no limitations, the industrial application of light should expand further to make even greater contributions to the happiness of mankind. If that is the case, what can Hamamatsu do as we approach the centenary of the development of television? Hamamatsu is an ordinary regional city, which is neither a political nor economic center of Japan. Yet, the world knows “Hamamatsu.” The world's attention is upon the city. Why? That is because Hamamatsu is home to people who identify unlimited potential in the industrial application of light and continue to test the limits of photonics technology. Hamamatsu has numerous organizations that have made a number of achievements in research and development involving light. However, given the amount of issues faced by the Earth and human race, light should offer greater benefits, which we must take advantage of. This is why we wish to give a "new mission" to Hamamatsu and turn it into reality. Establish Hamamatsu into a Preeminent Photonics City, where brilliant minds from around the world would want to study and engage in R&D even just once. Wherein the intriguing nature and limitless potential of light are communicated and educated to younger generations. Shizuoka University, Hamamatsu University School of Medicine, the Graduate School for the Creation of New Photonics Industries, and Hamamatsu Photonics K.K. will work in close partnership in all actions that could lead to establishing Hamamatsu as a Preeminent Photonics City. 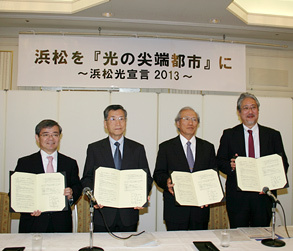 Work toward establishing Hamamatsu as a Preeminent Photonics City, as stated in this Declaration. Take an initiative in actively working toward this goal. Preeminent Photonics City Hamamatsu will network with the rest of the world to achieve cutting-edge photonics research. Preeminent Photonics City Hamamatsu will constantly remain conscious about the industrial application of light. Preeminent Photonics City Hamamatsu will extend assistance in response to swift moves by venture businesses. Preeminent Photonics City Hamamatsu will coordinate with the measures of national, prefectural and municipal authorities to contribute to advancing Japan's basic research and applied research, and reinforcing its industrial competitiveness.